Jon-Christopher Clark said the so-called lie detector tests are not admissible in court and he didn’t want an "interpretation on my feelings." Jon-Christopher Clark, 23, and girlfriend Kiera Bergman, 19. The boyfriend of missing Arizona teenager Kiera Bergman said Friday that he has refused an offer by Phoenix police to take a polygraph test. “I didn’t want to do anything that would give the indication I was hiding anything but also didn’t want anything on the record that would have them say I was doing anything or had any part in this,” Jon-Christopher Clark, 23, told HuffPost. While it’s not unusual for investigators to request a significant other to come in and speak with them during a missing person investigation, Clark claimed that he wasn’t given the opportunity before being “abruptly surrounded by 20 tactical officers” while checking out of a local hotel. “They handcuffed me, put me in back of a car and, when we got to the interview room, [they] handcuffed me to a table the entire time,” Clark said. Bergman, 19, vanished without a trace from her Phoenix apartment on Aug. 4. According to her roommate, Destiny Hall-Chand, the two had been working at a Glendale furniture retailer that morning. Bergman, Hall-Chand told police, became noticeably upset and left work early. Clark said he picked Bergman up from work and took her back to the apartment, where he also lived. He claimed they got into an argument over finances. Bergman mistakenly thought Clark was leaving Phoenix, where the two had moved together from San Diego, for a job in Texas. The last contact Clark said he had with Bergman was when she walked out of the house around 1 p.m.
Bergman was not at the apartment when Hall-Chand arrived after work. Hall-Chand, a former classmate of Bergman’s, told police she texted her roommate several times. Bergman eventually responded, saying she was going to go out with a man she’d recently met. Bergman’s father, Chris Bragg, said he and his wife did not discover she was missing until Aug. 6, when they received a phone call from Hall-Chand. “Around noon she called my wife and told her what was going on and asked if they should report Kiera missing, and my wife said, ‘Absolutely,’” Bragg said in a Friday interview with HuffPost. Clark said he did not learn of the text message his girlfriend allegedly sent to Hall-Chand until they were on the phone with police. “I didn’t know anything about that,” he said, saying Hall-Chand had denied speaking with Bergman. Clark said Hall-Chand’s boyfriend has “cut off all communication” between them. Bragg said he was told Hall-Chand and Clark called police together, but Clark left before the police showed up, “which was odd,” he said. Clark acknowledged he left before police arrived, saying he was “staying with a friend” at the time and was unable to connect with investigators until they picked him up Monday. Clark said he fully cooperated with police, except for agreeing to take a so-called lie detector test, and he did not request an attorney. Clark and Bragg both told HuffPost they did not get along, even before Bergman’s disappearance, which heightened tensions. 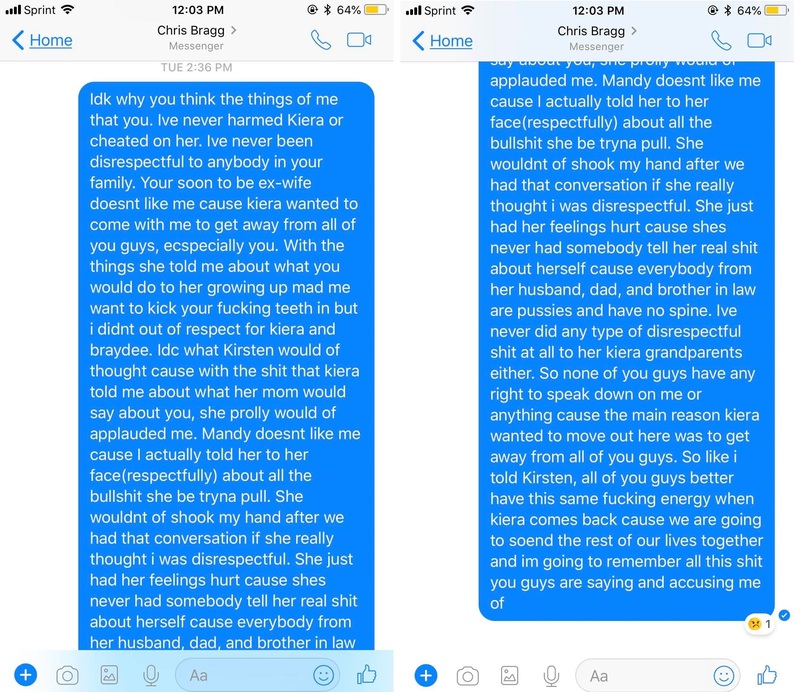 Bragg said Clark sent him a Facebook message on Tuesday in which the boyfriend threatened to “kick my teeth in.” Clark admitted sending the message to Bragg and provided HuffPost with screenshots of the conversation. Bragg said Hall-Chand had not been in communication with his family since last Saturday, when she let them inside the apartment she shared with their daughter and Clark. HuffPost was unable to contact Hall-Chand. During the tour of his daughter’s apartment last week, Bragg said, his daughter’s bedroom was the only room in the home where it was apparent crime scene technicians had removed items. Bragg also alleged that authorities told him investigators had found some of his daughter’s personal belongings in an unusual place. Authorities on Friday would not confirm or deny that Bergman’s personal items were found in a closet. Bragg described his daughter’s disappearance as “devastating” and said he hopes guilt will eventually provoke someone to come forward. The family has started a GoFundMe campaign to raise money for travel and search expenses. As of Friday, the campaign had raised more than $15,000. Friends and family members are also posting updates on Facebook. They are encouraging everyone to share Bergman’s story using the tag #bringkierahome. Kiera Bergman is a black woman, 5 feet, 3 inches, and 145 pounds. Anyone with any information is asked to call the Phoenix Police Department’s Missing Persons Unit at (602) 534-2121.